Breakfast is the most important meal of the day. It can also be the yummiest if you are tucking in to our delectable breakfast waffles. Generously portioned, very filling, attractively presented and most importantly, mouth-wateringly delicious, our breakfast waffles are a great start to the day! Did we mention that you can feast on the waffles whilst enjoying the picturesque views of the Indian Ocean and taking in the refreshing sea air? And the prices are great too! 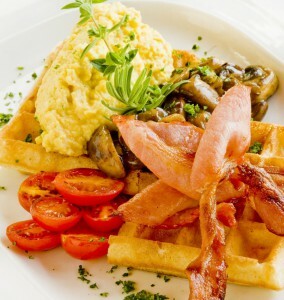 For just R35, you can pamper your taste buds with a crispy Belgian waffle with a side of perfectly cooked scrambled eggs, carefully grilled fresh tomatoes and a drink of your choice (tea, filter coffee and juice are your options). If you prefer your breakfast waffle English style, bacon, mushroom and mince toppings are added to the mix. Health-conscious individuals will love the nuts, banana and muesli waffle topping. Offering more variety to the list of toppings is a maple syrup and savoury-sweet bacon combo, and peppadew and feta. For great breakfast waffles, head to The Waffle House. You are sure to enjoy a memorable waffle experience.